Those of you who I ordered a shirt and didn't pay. You have until next Tuesday at Noon or I will release them to first come first serve for $15. 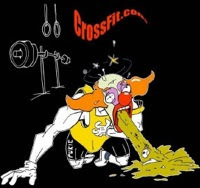 Crossfit 101 course August 5th at 6 p.m. send an e-mail if you wish to enroll. If you see something wrong with this front squat post it to comments. Pick up your T-shirts I do have a few extra in size Large. 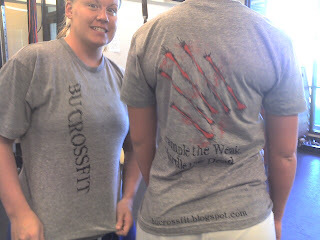 The new BU CrossFit T-shirts are in, see Mike before Noon Friday! If you want them for the Weekend. Jessica and Ali take on "DT" while Doddsy admires BU CrossFit women working it out! 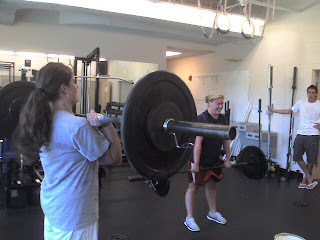 Micha and Melissa hustling back to the bar for more front squats! I used to Back Squat. A year ago I stopped. Of course I needed a lower body exercise. I choose the Front Squat. 7 benefits of the Front Squat. This will prevent you to lift as much weight as with the Back Squat. 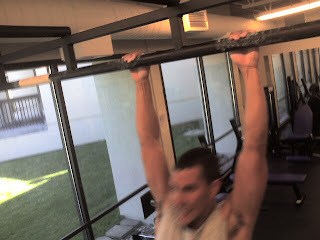 Less weight on the bar, equals less Spinal Compression. 2. Less Spinal Flexion. 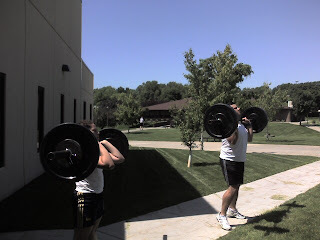 The upright stance during the Front Squats, makes it impossible to lean forward. If you do, the weight drops. This decreases your chances of bending your back. Which is much safer. 3. Less Torque. 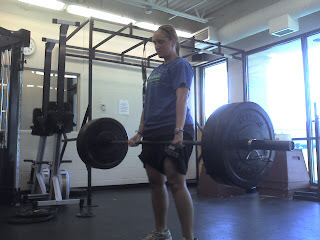 During a Front Squat, the torso stays nearly vertical during the whole lift. This puts less rotational force on your lower back. Another benefit of the Front Squat’s upright stance. 4. Less Chance of Bad Form. Your torso is not erect during the Front Squat: the bar drops on the floor. You don’t place the bar correctly: the bar drops on the floor. You can get away with bad form on the Back Squat. Not on the Front Squat. 5. Abdominal Training. Keeping your torso erect during heavy Front Squats requires a strong set of abs. The Front Squat is a great exercise to work your entire core. If you lean forward too much during Back Squats, start doing Front Squats. They will quickly solve this problem. 6. Quadriceps Development. The Front Squat will develop your quadriceps like nothing else. The upright stance emphasizes the quadriceps more than a Back Squat does. Take a look at the quads of weightlifters. You’ll get what I mean. 7. Carry Over. The Front Squat imitates the catch position of the Clean. 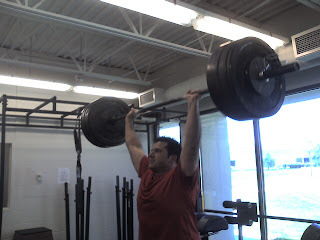 If you intend to Power Clean one day, Front Squats are a good way to prepare yourself. Same for the Overhead Press. 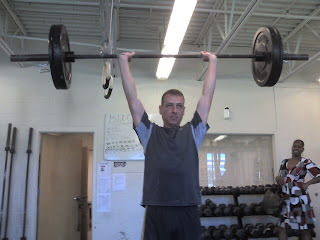 The starting position in the Overhead Press is identical to the Front Squat. Affiliate teams racing to the finish at the 2009 CrossFit Games. 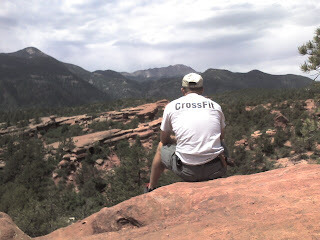 Micha knows Thrusters, I can't wait until he meets "Fran". 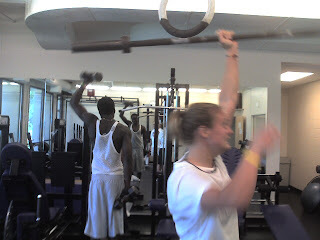 Eric mashing the Thrusters, Bridgette admires the WOD in back. Mike Livergood enjoying Pike's Peak in the distance. 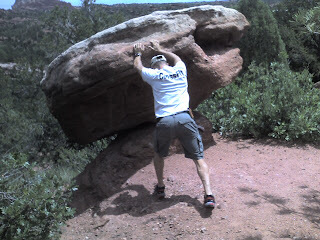 Mike's almost got it, just a little bit more, CrossFit Rocks! This was going to be used for the WOD but it wouldn't fit in my truck. 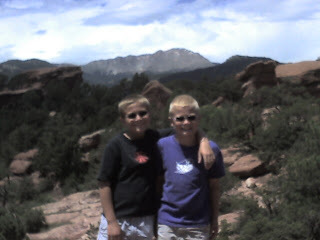 Jake and Matt in the Ute Native American's back yard. 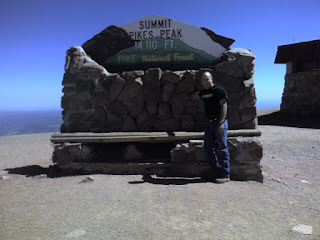 Mike Livergood at the summit of Pikes Peak 14,110 ft.
As many rounds as you can in 20 minutes. I wish we all could get along! Major Donald Clarkson, Centurion CrossFit Fort Hood, 1st place Combat Rifle Individual Event, 2009 Phantom Warrior Marksmanship Competition. Take a moment and remember those who helped us gain and maintain our Independence. The Gym is closed today to observe July 4th. Go heavy, run fast. Post time to completion and loads to comments. 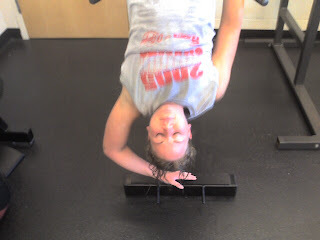 Val cooling down with some GH situps.